Heterocyclic rings having nitrogen atoms are the molecular fragments most used in drug design by using the tools of medicinal chemistry. The 1,2,4-triazole rings are part of an extensive family of drugs that are in use in the pharmaceutical market. More recently, 1,2,3-triazole rings have begun to arouse the great interest of scientists and therefore, many researches have been developed seeking the synthesis of new substances and their possible biological activities. 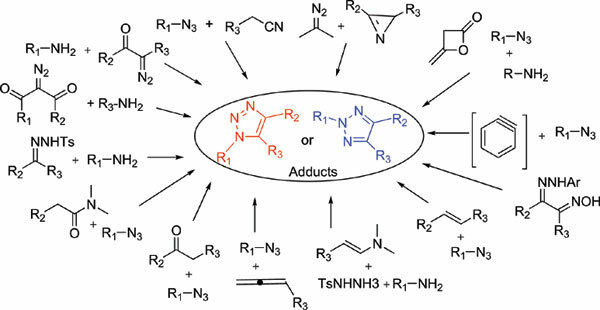 A number of articles have been published by us and others highlighting the synthetic and biological aspects of 1,2,3-triazoles. The growth of new substances of this class was largely due to the simple and selective synthetic method of 1,2,3- triazole ring developed by Sharpless et al. However, some 1,2,3-triazole cannot be synthesized by this method. This review focuses on other synthetic methods that give access to other variations around the 1,2,3-triazole core. The systematic arrangement in this review explores the possibility of providing practical guidance to alternatives of this heterocycle. It has been divided into sections according to the types of starting materials and reactions. Heterocycles, Azocompounds, Biological activity, Drugs, 1, 2, 3-Triazoles, Drug design.